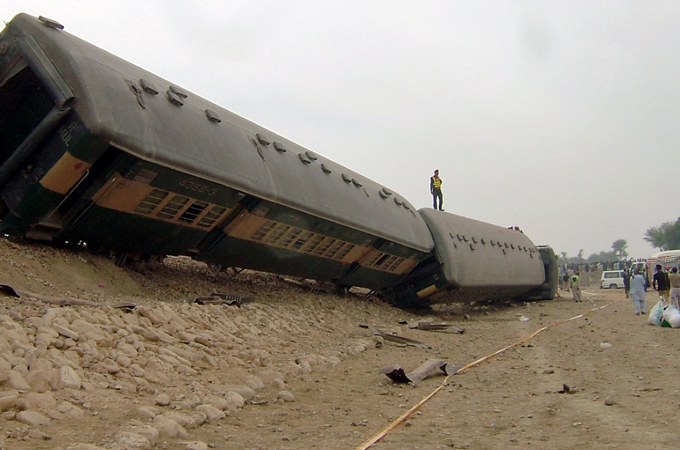 A train has been derailed by a bomb in Southern Pakistan and it seems the Baloch Republican Army may have claimed responsibility (I am relying on twitter here, I have not yet seen a formal claim of responsibility, but it is certainly a strong possibility given that there have been earlier train attacks claimed by Baloch separatists). Several children are among those killed and children have died in almost every train bombing to date. This has started the usual back and forth about terrorism as a tactic and someone mentioned the inevitable "terrorism is the weapon of the weak". If the BRA is responsible, then they are being very self-defeating here. It is a Pakistani myth that terrorism is the weapon of the weak. It may be a weapon sometimes used by the weak, but it has never gotten them very far on its own. From Palestine to Chechnya to Kashmir to Balochistan...it just makes the strong more easily justify their oppression. Terrorists like TTP are winning because they have inside support, they have a more coherent narrative than their enemies, they have strong (minority) ideological support throughout Pakistan and above all because they are STRONG enough to beat up the so-called army and get away with it. The Baloch are not that strong. They will only increase their own suffering. Armed struggle is not an end in itself, it is a tactic. Like all tactics it has to form part of some greater whole. If sensibly applied, it can be critically important. If not, its just so much more pain and suffering with nothing to show for it...or it makes things worse. This is just sad. 1. I am not discussing the morality of terrorism (I personally believe deliberately targeting innocents is ALWAYS morally wrong, but that is not my point here). 2. Can it sometimes work? Sure it can. There is no universal umpire making sure such things never work. As part of some larger effort, where some clever and ruthless leaders are using the careful application of terror as one element in a larger strategy it can (unfortunately) be part of a winning effort. But not by itself. In this case there is no well defined and united Baloch leadership out there, who may be using these attacks as well defined parts of a larger effort. A Baloch Lenin or Mao (or even a Baloch Molvi Fazlullah) could use terrorism as one part of a larger, well thought-out effort. A Baloch group that just blows up stuff here and there is only getting more innocents killed. 3. Could Balochistan see a more serious and more dangerous (and potentially successful) liberation struggle in the days to come? It could, mainly because the people oppressing them are so good at scoring own goals and messing things up. Even so, it seems unlikely to succeed unless an outside power (aka the United States) makes (or is making) a VERY serious effort to make this happen. Otherwise, this struggle can go on for a long time, but it wont lead to successful secession. A Gandhian approach will not necessarily work either, but may be a better bet. It could conceivably co-exist with a relatively narrowly targeted armed insurgency, but not with one that uses indiscriminate terrorism...the state will simply use the terrorism as justification to wrap up the non-violent side and nobody will be able to stop them; "civil society" and international pressure will be blunted by the existence of terrorism..... and.the terrorists will not be able to help their civilian sympathizers because a bit of terrorism here and there is all they have, unlike the TTP, who can turn it on and off and negotiate concessions for their front organizations using calibrated and credible threats. Ghandian approach worked in India because: British were always vastly outnumbered, Brits being part of White Colonialism had to contend with the world narrative of the Browns (or Blacks) fighting for independence against the White overlords. Britain wasn't in mold of barbarity as Belgian, Spain and Portugal. From my reading of the news over the years; Baloch separatists simply do not have the power and influence that the Pashtun dominated TTP have so as you say what works for TTP does not look like it will work for Baloch separatists.